First project that I have sold to a customer – many lessons learned. Priced at 1100 and realized really quickly that I underpriced the project. The raw material cost was pretty low (~300 dollars) – but was surprised that it took as long as it did. 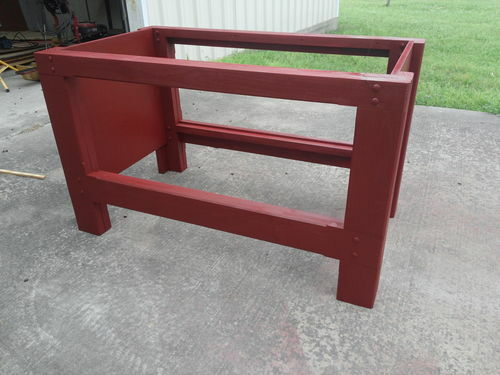 I never have luck painting projects – tried a sprayer for the firts time and hated it. So ended using a brush and roller. What should have taken me 3 days to complete ended up taking me close to 5. Basically worked for roughly 9 dollars an hour when it was complete. End product looks amazing – picture doesn’t do it justice. Great looking project. I’ve been considering building something like that myself. I similarly have considered building stuff (for money), outside of day job. But I just can’t make the economics of it make sense. In order to make it worth my time, I would have charge such ridiculously high prices that I don’t know who would ever consider spending that much. Only ultra high-end custom stuff at posh galleries or something. But I’m far from a master-level woodworker, so I don’t think I can justify my price. There was a great article about a year ago in Popular Woodworking (or Fine Woodworking maybe, I don’t remember). It was about three or four different people who are professional woodworkers, and the different routes they take. One was Jeff Miller, and he said how he can make it work because of all of the guest teaching and appearances he does and the extra income it brings. Another guy basically builds stuff like 10 at a time, so he can quasi-mass produce stuff and minimize set-up times. 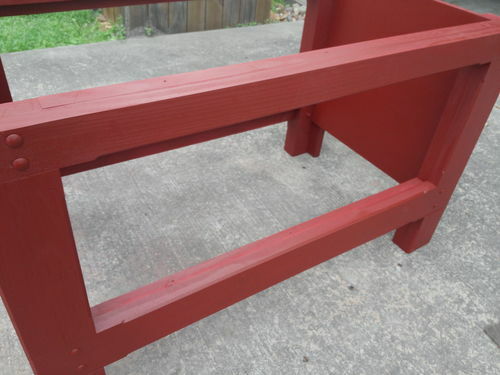 I think it was that guy who said he needs to design his furniture so it can all be made by power tools, because once he touches a hand tool, there goes his profit (because it takes too much time). It was a VERY good article, and very eye opening. Definitely made me realize that it is way too difficult to try to make a go at professional woodworking. what sort of sprayer did you use? I ask, because I’ve had ups and downs with them. I only do work for my own personal amusement, so my interests dont exactly line up with yours, but finishing is my least favorite part of projects so I am always looking to minimize my time spent doing it. My first sprayer was an airless electric Wagner. It produced pretty good finish quality, but I never liked getting it out due to the amount of cleanup needed. Then I bought the cheap HVLP sprayer they sell at harbor freight ($9.99 right now). It’s a cheap tool, and there are much better options out there, but I have found that this style of sprayer is way better. It uses less finish to get the same coverage, and I felt the end result looked smoother. Also, the path that paint travels is shorter, and the parts are metal, so cleanup is way easier. At any rate, I hope this my $0.02 helps some. Thanks for posting. And I feel you on the time budget. I spend a lot of time obsessing on details, and that alone would kill me commercially! Thanks guy – I used a Ryobi paint sprayer from Home Depot. Honestly – I probably paid less than 70 dollars for it so I guess I should have expected it to be fairly poor. I have a pretty decent HVLP unit I purchased from Rockler – but didn’t want to use it with paint. My experience with sprayers is that it basically spits tiny dots of material onto your project – the surface ends up rough. I have the same exact issue as you – I HATE TO FINISH MY PROJECTS. I love the build but hate the finish. I always spend twice as long finishing as I do building. I think my problem is that I feel that there should be a sprayer to quickly finish the the piece in minutes, without sanding. I would love to get everyone’s opinion on how much time finishing vs. build takes. Also – Andy, totally agreed with your comments above. You’re right, the only way to truly make money is to mass produce and never touch anything by hand. This piece was custom, so I had to basically draw up the plans from the start and do all the Math. That part isn’t included in my 5 day build. If you want to reserve your rockler gun, try the HVLP at HF. For $10-15, you may be surprised. My wagner left the dots you describe. So did the HVLP, but they were much smaller. pics below are water based indoor paint from the HVLP on the workbench i’m building. As I understand it, the biggest problem with HVLP is keeping water out of the line, but this only applies for non-water based finishes. I think with more experimentation with thinning and spray pattern, you can eliminate the dots. The project looks great and you made some money. If you took production notes you’ll make more money on your next project, maybe. Been there done that, not correctly estimating time and materials to bring in a reasonable profit. You produced a very good looking project with a $9 per hr. return better than a negative return. Always better to bite the bullet and do it right even if cost you extra. I just counted it a purchased education I think it has to do with Growing pains. Thanks for sharing both the project and your experience. Very nicely done! I love all the details and it looks professional. Nothing beats building something unique like this to fit someone’s needs just right. I posted a similar project which I built for my wife a few months ago. I didn’t care about making money obviously, but I kept thinking about all the time it took to build. I probably would have come in at $3/hr LOL!! But $800 extra in your pocket can buy you a few new tools and hopefully you enjoyed building it. Nicely done project! Its a bummer you weren’t able to get the sprayer to work properly. 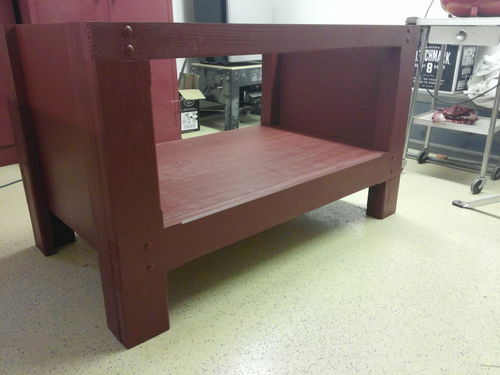 I have sprayed many a paint project and have recently began spraying tinted lacquers as well. Makes things go SO fast. Either way, it looks great, and they got a good deal! great, great job. thanks for sharing. wish we had room for one of these!